I’m continuing to do early versions of “The Best Of The Year” lists so in December, when I do the final ones, I won’t have to review an entire year’s worth of posts. 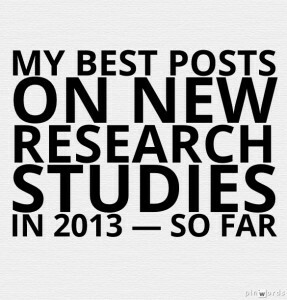 I write many posts about recent research studies and how they can relate practically to the classroom. In fact, I post a regular feature called Research Studies of the Week. In addition, I write individual posts about studies I feel are particularly relevant to my work as a teacher. How Many Studies Must A Man Do Before He Gives Up On Trying To Prove Extrinsic Motivation Works? Won’t Researcher Roland Fryer Ever Give Up On Trying To Prove Extrinsic Motivation Works Better Than The Intrinsic Kind? How Did I Not Know About This National Academy Of Sciences Report On Student Motivation? “Short Bouts of Exercise Boost Self Control” — Is That Your Experience With Students? Study: More Power Equals More Self-Control & Less Power Equals — You Guessed It! How Do We Contribute To Students Being Rude In Class?